Saw this on Twitter this morning, posted on the RealCrozetVA Facebook to great comments, and wanted to put it here. 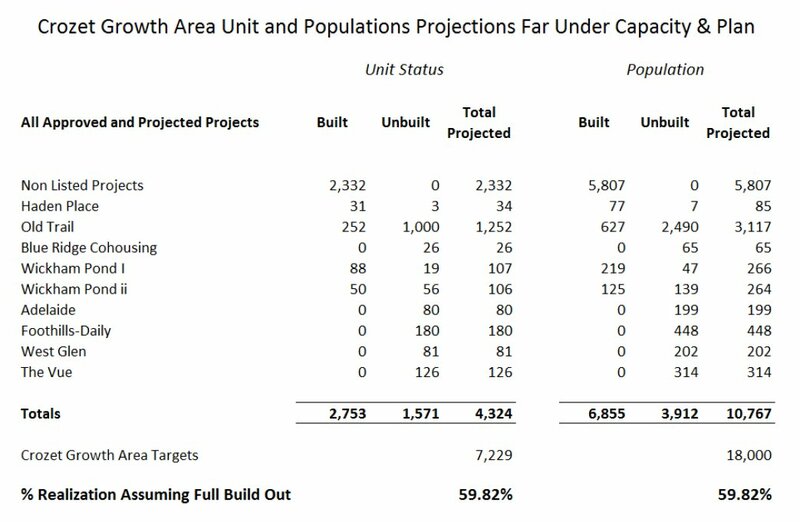 Crozet Build out numbers – prepared by Kyle Redinger, developer of Adelaide, based on numbers from Albemarle County … see the “context” link below. Can the infrastructure handle the growth? What businesses are being sought to balance the growth, so that tax burden isn’t shouldered by residential? Made the change. Thanks, Allie! Certainly, you are more than welcome to calculate whatever numbers however you want. The unbuilt numbers were estimated based on known population figures, and derived from the 2.49 heads per household estimate that is reflected in the 2010 census for the Crozet zip code and also given by staff. The point was to compare the population and units to stated targets. You are welcome to prepare your own calculations and and your own thoughts, instead of insinuating untruths. Those figures are all staff numbers. The 2.49, the population estimate, and the known units that they supplied in that table. This table just make it more legible in the context of what’s there now and what’s known to be coming. It is missing unknown projects, because those projects are unknown. I’m insinuating bias. The headline to your chart should not be construed as coming from county staff members as an official statement. And there are no conflicts or bias owning the largest developable by right property in downtown Crozet? I believe the truth is the county is still trying to get a more accurate determination of the current state of the buildout population for Crozet. For instance, the chart above does include the Chesterfield Landing development. During the discussion on Adelaide by the board of supervisors, Jeff Werner of the PEC actually complained that the county has not been more forth coming in providing more accurate growth data. To the best of my knowledge when it comes to the target population there has been only number ever published for the “Maximum Ideal” population for Crozet and that came from the consultants who did the initial work for the Neighborhood Model and that number was 12,189. While there have been many numbers thrown about I believe this is the only published data based on actual population data done by knowledgeable consultants. One thing of interest was the fact that Liz Palmer, the supervisor for the Samuel Miller district, which covers Rt. 250 gave as the reason for her vote for denial is the impact of growth in Crozet on her constituents with regard to traffic on Rt. 250. To this the applicant answer was to widen Rt. 250. Problem here is in 2001 there was an approved resolution by the board to protect Rt. 250 as a two lane road and I don’t think the Samuel Miller residents have changed their minds. Perhaps it is finally dawning on the members of the board that when you increase the population in our growth areas all of the impact is not just local or more simply put “what happens in Crozet doesn’t stay in Crozet”. Obviously as part of our Master Plan update one of the first issues to deal with will be to obtain accurate population numbers and to clear up exactly what is the buildout population figure. Once we have the data and the buildout population we can then look at the remaining land available for development and make the appropriate land use decisions to reach our goal. Can water & sewer and electric instructure handle the projected population increase in the near and long term?